We sent one of our experienced Callers to a Social Event IN WEALDSTONE, MIDDX. A very lively event which involved Barn, Square, Line Dancing and Scottish Dancing as well. A huge variety of Music and Dancing enjoyed by everyone. 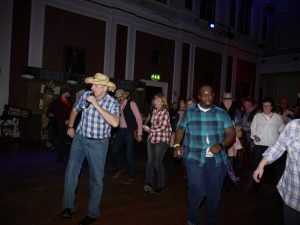 BARN DANCE LINE DANCE CALLER IN MIDDLESEX AND SQUARE DANCE CALLER HIRE for all Social events.